Located to the west of Moscow, Mozhaisk seems to have been sacked by every army to ever have attacked Russia. Among the many small historic towns to the west of Moscow, none has had a more turbulent history than Mozhaisk. Scenically located on high bluffs near the confluence of the Mozhaika and Moscow Rivers, early medieval Mozhaisk developed at the intersection of major trading routes, from Smolensk in the west to Vladimir in the east, and from Novgorod and Tver south toward Ryazan on the Oka River. This geographic advantage in peaceful times would, however, prove a curse to the settlement over the centuries of warfare that defined Muscovite history. Although the fortress at the center of Mozhaisk was well defended by natural features such as deep ravines, it was frequently ransacked by attacking forces. Mozhaisk is first mentioned in the medieval chronicles in 1231 when it faced attacks from the armies of both Novgorod and Vladimir. The Mongol invasion later that same decade would in its destruction dwarf anything yet seen in medieval Rus. In 1275, Mozhaisk was inherited by Prince Fyodor Rostislavich Chyorny (1233?-99), a fascinating figure who was befriended by the Mongol Golden Horde and married the daughter of Khan Mengu-Timur. The strange biography of Prince Fyodor is emblematic of the chaos of 13th-century Rus, wracked by incessant infighting among feudal princes and raids by Mongol (Tatar) forces. Indeed, Prince Fyodor himself sacked Mozhaisk in 1293 as part of a large campaign led by Dyuden, one of the sons of Khan Mengu-Timur. In 1303, Mozhaisk was seized by Moscow Prince Yury Danilovich, who understood the strategic significance of its fortress as a bulwark on Muscovy’s western borders. This strategy proved sound in 1341 and 1368 when Mozhaisk withstood attacks by Lithuanian Prince Olgerd as part of larger campaigns against Moscow. Much of the town’s outlying areas were burned during these seiges. Mozhaisk was again devastated by Khan Tokhtamysh in 1382 during an invasion to reassert the authority of the Horde over Moscow’s Grand Prince Dmitry Donskoy, who had defeated the large Tatar army of Khan Mamai at the Battle of Kulikovo in 1380. To get to Mozhaisk first take a regular train from Moscow (Belorussky railway station; departure every 20-30 min). The trip takes approximately 2 hours. A survey of this litany of devastation suggests that the fate of Mozhaisk reflected the violent history of all medieval Muscovy. From 1389 to 1493, Mozhaisk existed as a major feudal principality subordinate to Moscow. In the early 15th century, Mozhaisk benefited greatly from the establishment of the Luzhetsky Nativity of the Virgin Monastery, overlooking the Moscow River on the northwestern fringe of town. Its founder, St. Ferapont of Belozersk (1330s-1426, canonized in 1549), was a monk of noble origins and a disciple of St. Sergius of Radonezh, the avatar of Muscovite monasticism. Ferapont had come to the attention of Prince Andrei of Mozhaisk, son of Moscow’s Grand Prince Dmitry Donskoy and holder of title to the northern lands around White Lake (Beloozero). At Andrei’s insistent request, Ferapont arrived at Mozhaisk in 1408 to establish another monastery dedicated to the Nativity of the Virgin. The prince supported the endeavor with the construction of a small limestone church, whose foundation is visible at the monastery. Excavations at the site in 1997 uncovered what are thought to be the remains of St. Ferapont. The memory of St. Ferapont is still venerated in Mozhaisk. In the nearby village of Isavitsy, a log chapel was erected in his memory in 2008 on the occasion of the 600th anniversary of founding of the Luzhetsky Nativity of the Virgin Monastery. At the center of the memorial site is a sacred spring reputed to have been discovered by Ferapont himself. Visitors can freely take water from the site. 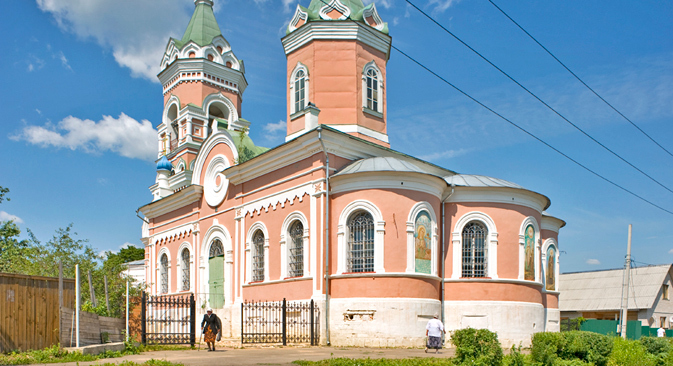 Also around the time of the monastery's construction, Mozhaisk became a destination for pilgrims drawn by an account of a miraculous appearance of St. Nicholas during one of the many attacks on the town. With upraised sword in hand, St. Nicholas is thought to have protected the besieged fortress. A major building campaign at the monastery began under the direction of Makary, who served as abbot of the monastery in 1523-1526 and continued to support it after becoming the metropolitan, or spiritual leader, of the Russian church in 1542. Makary played an important role in both church and state affairs during the early reign of Tsar Ivan IV (the Terrible) (1530-1584). With his guidance, a new masonry Cathedral of the Nativity of the Virgin was begun in the 1520s and consecrated in 1547. Mozhaisk reached the peak of its power during that same period. By the mid-16th century, the town had eight monasteries and around 35 parish churches, in addition to a cathedral dedicated to St. Nicholas. Ivan the Terrible made Mozhaisk a supply and command center in the early phase of the ill-fated Livonian War (1558-83), and the town was designated part of the tsar’s domains during the notorious existence of the oprichnina (1565-1572). The oprichnina was a state policy that included the creation of secret police, mass repressions, public executions and the confiscation of land from aristocrats. The demands of war and the misrule of the oprichnina imposed intolerable burdens on the town’s heretofore vibrant commercial activity, and Mozhaisk's townspeople left for newly opened lands along the Volga River following Ivan’s conquest of Kazan. The downward spiral was exacerbated by famine as well as by periodic outbreaks of the plague that began in 1566 and ultimately led to the town’s quarantine and depopulation. A limited attempt to restore the town during the brief reign of Boris Godunov (1598-1605) was curtailed by further misery during the interregnum known as the Time of Troubles. Occupied by various Russian factions as well as by forces supporting a Polish claimant to the Russian throne, Mozhaisk was thoroughly sacked. From a relatively large population of 10,000 in the mid-16th century, Mozhaisk was reduced by some estimates to fewer than 100 inhabitants by 1614. Following the establishment of the Romanov dynasty in 1613, Mozhaisk, like nearby Ruza, was unsuccessfully besieged in 1618 by Władysław, heir to the Polish throne, in an attempt to dethrone the young tsar Michael Romanov. Although Mozhaisk had lost its former significance, the town gradually revived in the shadow of Moscow during the 17th and 18th centuries. Because of its position on a major route to the west, Mozhaisk played a large role in support of a successful Russian campaign against Poland in 1654. Its position brought renewed danger during the Napoleonic invasion of 1812. Mozhaisk was gripped with military ardor as great armies converged on the nearby village of Borodino. Following the titanic clash of armies at the Battle of Borodino, Mozhaisk was filled with Russian wounded. As Russian General Mikhail Kutuzov’s main force retreated toward Moscow, the French occupied Luzhetsky Monastery on Aug. 27 and Mozhaisk the following day. When the French abandoned Mozhaisk during Napoleon’s retreat in mid-October, the town and the monastery were in a state of total devastation. Once again, Mozhaisk returned from ruin to its status as a modest regional center during the 19th century and into the Soviet period. Yet one final trial awaited from the west. In the fall of 1941, the area lay squarely at the center of the German attempt to seize Moscow. After desperate resistance, the town was seized by the Nazis on Oct. 18 and liberated on Jan. 20, 1942 as part of the counter-offensive following the Soviet victory in the Battle of Moscow. A visitor to the town’s attractive main boulevard, Moscow Street, will see memorials to the sacrifices endured during this turbulent past. Monuments to the dead — including a large mosaic — commemorate the valor of the town’s defenders over the centuries. At the very center is a bronze statue of St. Nicholas, testimony to the indomitable spirit of Mozhaisk.